Don’t Let Your Vision, Communications and Offers Undermine Your Success! You have a vision for your company’s growth. Is that vision in line with what your target audience wants? Are your strategies, communications style and offers keeping up with the right vision and consumer desires? To stay competitive in today’s fast-paced world of choice and convenience, it’s crucial that you know your target customers needs, wants and aspirations and make sure you are offering products and services that deliver on them. Your growth and survival depend on it. 3) sets you apart from the competition. This approach compels your target audience to choose and refer your company over your competition. Let us help you to take market share away from your competition today! You need more than a vision in todays marketplace. Let us help you tell your story, get your message out and empower your purpose. Call us today for a FREE initial consultation. Call (424) 331-9106! 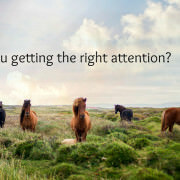 https://brandawakening.com/wp-content/uploads/2015/02/Horse-Attention-for-BA-Website-.jpg 513 999 admin https://brandawakening.com/wp-content/uploads/2016/09/BA-logo-enfold-1.png admin2015-02-25 01:59:562016-12-22 06:31:38Resonate! Are you and your customer a good match?